Introducing the Rosette® 300 Acoustic Combo with 300 Watts of portable power, 2 Channels and a professional grade feature set for home, studio or stage. 2x8 or 1x10 FORMATS. EACH OFFERING A UNIQUE TONAL CHARACTER! We are now proud to offer a choice of speaker configurations for the Rosette 300 Acoustic Amplifier. The detailed accuracy and dimensional width of the Rosette 2 x 8” Combo is now joined by an EQ friendly Rosette 1 x 10” Combo for yet another take on accurate acoustic amplification. 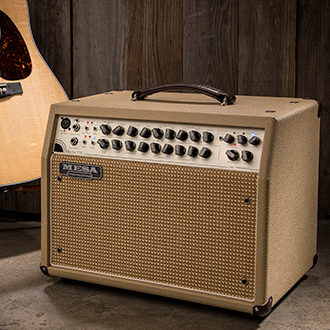 The original Rosette Combo trades the finger-style enhancing mid-focus and detail of the 2 x 8” speaker configuration for a warmer, mid-scooped character in the new 1 x 10” Combo that also re-voices the top-end in a pleasing way that complements flat picking and strumming. 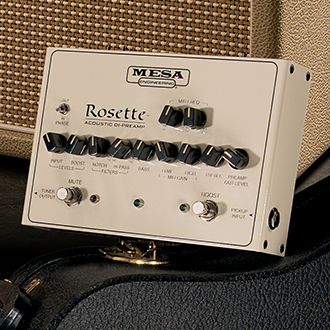 The Rosette 1x10’s “mainstream” sonic signature makes it easier to get accurate, inspiring sounds quickly and with less adjustment of the amplifier’s powerful controls and creates a friendly all-around tool in contrast to what some experience with the 2 x 8 Combo as a surgically precise instrument. Both are valid and have their place, each owning a musical niche and reproducing differently yet accurately, a range of sonic tastes and playing styles. Our reverence and appreciation for acoustic instruments guides the designs of the Rosette Series products. Our commitment to produce innovative, reliable and inspiring musical instrument amplification for nearly 50 years, finally includes the incredible world of acoustic instruments. For detailed product info, please visit FULL DETAILS. For all technical specifications, visit the Rosette 300 Two:Eight Combo or One:Ten Combo FORMAT pages.